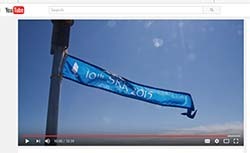 2019 SRR Event Notification is posted! 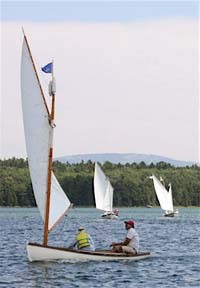 We have the dates for the 2019 Small Reach Regatta: July 25–27. We'll arrive Wednesday July 24 and haul out Sunday, July 28. Same location as the previous few years using Atlantic Boat Company for launching and mooring and the OCRK campground. We have in mind something a little different this year: a one-say sail from Herrick Bay to the anchorage off the OCRK campground, then sail back the next day. (Which days depends on weather.) A day of daysailing either before or after the two-day trip. Boating safety is always a priority at the SRR, and the fleet is accompanied at all times by a chase fleet, usually six fast powerboats. Participating boats are required to meet a checklist of safety equipment. Our safety demonstrations in years past have included a firing of emergency flares and a deliberate capsize and self-recovery. We take safe seamanship seriously. David Wyman, P.O. Box 505, Castine, ME 04421; 207–326–9406; <david@dwymanpe.com>. E-mail is our preferred method of communication. We’ll get back to you as soon as we can. We hope to see you this summer on the coast of Maine! 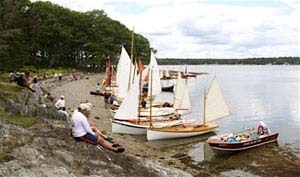 In 2006, a group of sail-and-oars boats gathered for an informal cruise in Maine to answer a question: could we succeed here with a large gathering of such boats, inspired by “Raids” in Europe and by the famed Eggemoggin Reach Regatta for classic yachts? The reply was an enthusiastic “yes,” and for three more years like-minded people sailed the same waters the ERR has sailed annually since 1985. This experience gave us our name—the Small Reach Regatta, and today we are organized entirely under the auspices of the Downeast Chapter of the Traditional Small Craft Association. The idea of the SRR is to gather together small sail-and-oars boats for sailing, with the same kind of camaraderie and appreciation that the ERR has established. We will sail on Thursday, Friday, and Saturday. This year, we plan a one-way sail from Herrick Bay to the waters off the campground, where we’ll anchor, so secure anchoring ability is especially important. The next day will be a return to Herrick Bay. Final haulouts, trailering, and departure will take place on Sunday, July 28, vacating the campground before noon and the boatyard as soon as possible. We have established several alternative daysailing courses of between 7 and 15 nautical miles. A day’s outing may be cancelled if the weather conditions are poor. No racing is planned. Many of the boats were built of wood by their owners themselves, and some of them were even designed by their builders. We don’t have hard-and-fast rules about boat minimum or maximum lengths, knowing that the nature of traditional small craft is highly variable. The largest boat has been 22’, and the smallest 13’. They ranged from elegant yacht-like constructions to boats inspired by workboats such as sailing dories. Generally, the boats must be able to put in to a beach and relaunch without assistance and must have oars as auxiliary propulsion. The fleet will be based at Herrick Bay, thanks to the generosity of Cy Hannon, proprietor of Atlantic Boat. The yard has an excellent launching ramp, a good pier, quite a number of floats, ample space for trailer parking, and frontage on a large anchorage. The bay has excellent sailing access to Blue Hill Bay, Jericho Bay, Casco Passage, Eggemoggin Reach, and potentially to the eastern part of the Deer Island Thoroughfare. For the event dates, we've engaged the entire facility of a campground in Brooklin, called Oceanfront Camping at Reach Knolls, which is on Reach Road about six miles away from Atlantic Boat and can accommodate all our participants.